It just might the most successful television sponsorship for a major travel company—and now it's going to continue through 2015. Viking Cruises, which now has well over 50 river ships as well as a new oceangoing cruise vessel set to debut next year, has extended its corporate sponsorship of PBS’ widely praised Masterpiece, which includes the Emmy award-winning "Downton Abbey" and two other hit series, "Mr. Selfridge" and "Sherlock." 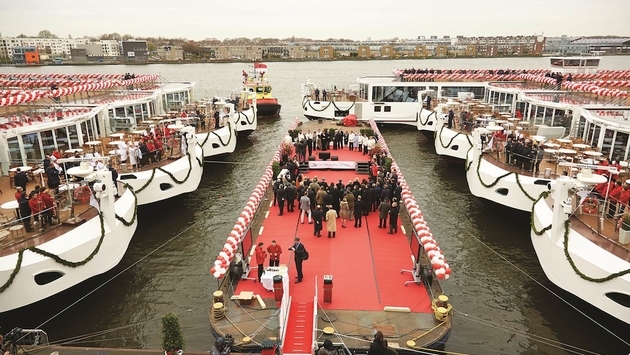 Viking has sponsored Masterpiece since 2011, which has given the company wide visibility at a time when it has been dramatically growing its river cruise fleet in Europe and around the world. It also unveiled plans last year to start an ocean-going cruise line, with the debut of Viking Star set for next March and another vessel to come in 2016. Viking has been the only river cruise line to launch a national TV advertising program, with its sponsorship of Masterpiece, as well as ads on CBS News and CNN programs. "Downton Abbey," in particular, has given the line wide visibility as it has garnered numerous awards. Indeed, the series has earned 24 nominations for the 2014 Primetime Emmy Awards, which will be announced on Aug. 25. "Our partnership with Masterpiece is successful largely because of the similarities between our audiences," said Richard Marnell, senior vice president of marketing for Viking. "Viking's guests, many of whom are Masterpiece viewers, enrich their lives through history, culture and exploration. We strongly believe in marketing the Viking experience to like-minded travelers, so we are proud to continue our relationship with Masterpiece, and we congratulate them on their 2014 Emmy nominations." Viking has tied its product closely to "Downton Abbey," offering an optional excursion to Highclere Castle in England, the setting for the TV series, as a pre- or post-trip option for customers on its "Cities of Light" and "Paris and the Heart of Normandy" itineraries. This past year Viking christened a record 18 river ships, including 16 of its Longships, in four countries over five days. It also has unveiled plans to launch another 12 river ships next year. That will bring its total number of river ships to 64. In addition, Viking will christen the 930-passenger Viking Star, its new oceangoing vessel, on May 17 in Bergen, though the ship will actually begin sailing before that. May 17 is Norway's Constitution Day.